OS grid reference SX2593 6881. 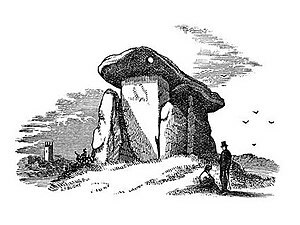 Some 2 miles to the west of the B3254 road between Liskeard and Launceston and 1 mile east of Tremar Coombe, on the edge of Bodmin Moor, stands the prehistoric burial chamber or portal tomb called Trethevy Quoit. The monument stands in a field along a short footpath at the west-side of Tremar village, not far from Trethevy Cottage. The town of Liskeard is 5 miles to the south and the village of St Cleer is 2 miles to the south-west. Trethevy Quoit or ‘Dolmen’, to give it it’s other monument name, dates back at least 5,700 years. Locally it is called ‘The Giant’s House. Trethevy Quoit is still quite an impressive prehistoric monument standing at 9-10 foot high with it’s huge sloping capstone that looks as if it is poised to slide down to the ground at any moment! It is the largest and most impressive in Cornwall. The massive capstone is 12 foot long and is said to weigh 10 tonnes. It is supported by five upright stone slabs all roughly nine feet high and one other slab that does not connect with the capstone; originally there were seven uprights. Near the top of the capstone there is a large round hole, but what this was for is uncertain, maybe for astronomical purposes or to catch the sun’s rays at cerain times of the year (soltices), or perhaps it was made in more recent times? There is also some uncertainty about the age of the monument; some historians say that it is from the middle to late Neolithic Age around 3,700-3,500 BC (the middle Stone-Age), while others think that it dates from the Bronze Age (about 1,800-1,200 BC). 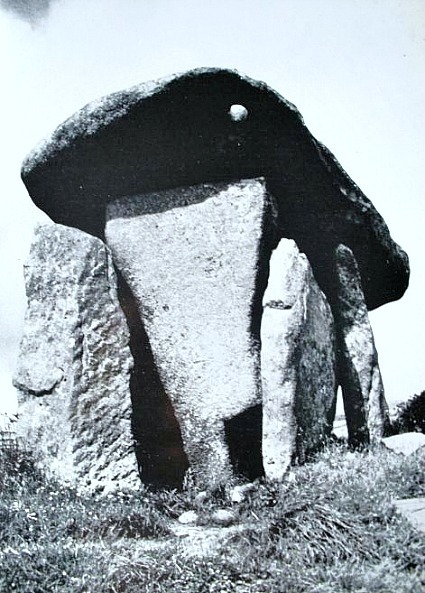 The back of the burial chamber has now fallen inwards, while at the front there is a large portal stone and a flanking stone that stands clear of the monument. But it seems that the funery entrance was not at the front but at the side where there is a square-shaped opening at the bottom corner to enable bodies to be placed inside. Originally a huge oval-shaped mound of earth would have ‘probably’ covered the stone chamber and was thought to have been over 6 metres in circumference – there is still a slight raised bank around the sides and evidence of the mound is still visible today. This was almost certainly the burial place of a chieftain or some high-ranking individual from a prehistoric tribe that inhabited the area thousands of years ago back in the mists of time. About 1 mile to the north-west stand ‘The Hurlers’, three early Bronze-Age stone circles. Darvill, Timothy, Glovebox Guide – Ancient Britain, AA Publishing, Basingstoke, Hampshire, 1988. Hogg, Garry, Odd Aspects of England, David & Charles, Newton Abbot, 1968. Bord, Janet & Colin, Ancient Mysteries of Britain, Diamond Books (Harper Collins Publishers Ltd), 1994. Categories: Burial Chambers / Cromlech / Dolmens, Trethevy Burial Chamber at Tremar in Cornwall | Tags: Trethevy Quoit near Tremar in Cornwall | Permalink.